Overview and chronological description of past activities and projects, beneficiaries, and areas of influence. The Bellerive Foundation was founded by the late Prince Sadruddin Aga Khan in Switzerland in 1977. Its major programmes focused on the link between the scarcity of natural resources and poverty in the developing world; the preservation of fragile mountain ecosystems; animal protection; and initiatives in environmental education. The Late Prince Sadruddin Aga Khan, paternal uncle of His Highness the Aga Khan, was the second son of Sir Sultan Mahomed Shah Aga Khan, who was the 48th Imam of the Ismaili Muslims and President of the League of Nations from 1937 to 1939. Sir Sultan Mahomed Shah Aga Khan’s first son was Prince Aly Khan, father of the current Aga Khan. Prince Sadruddin founded and chaired the Bellerive Foundation along with his wife, Princess Catherine. 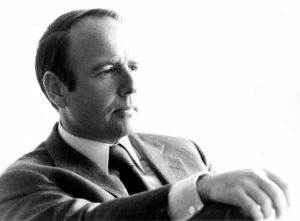 Prince Sadruddin served the international community in a variety of roles, including the United Nations’ High Commissioner for Refugees (1965-77) and the United Nations’ Coordinator for Assistance to Afghanistan (1988-90). He was also the United Nations’ Executive Delegate of the Secretary General for a humanitarian programme for Iraq, Kuwait, and the Iraq-Iran and Iraq-Turkey border areas (1990). Began as a newspaper in 1992 after a lively debate in the class of Mr. David Batten at the Pregny Primary of the International School of Geneva, became a professional magazine published regularly, thirty-six issues were circulated worldwide and greatly appreciated. EARTH FOCUS MAGAZINE GETS TO SOUTHERN KENYA, WE WOULD LIKE TO SHARE IT ALL OVER THE WORLD. Growing WISER with Earth Focus. 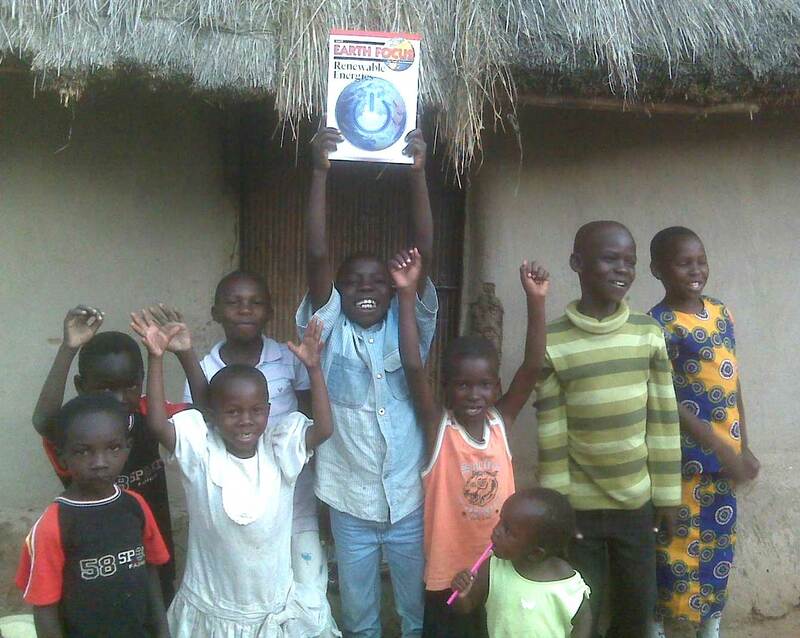 Students in Muhuru Bay, Kenya celebrate reading their first Earth Focus magazine as part of the WISER Bridge Programme that seeks to improve the standard of primary education in preparation for pupils, especially girls, to attend secondary school. In an area where only 5% of girls graduate from primary school, literature materials written by youth for youth provide a critical source of information and exposure for these students. The Earth Focus Foundation was founded in June 2005, it is a Swiss foundation, which is continuing the work with young people worldwide started within the renowned Bellerive Foundation. The aim of the Foundation is to empower young people of all ages to take on roles in which they actively create a more sustainable world. 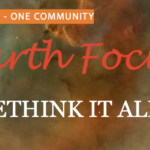 Earth Focus provides a platform to encourage respect and action to the subjects of sustainability – social, economic and environmental and share expressed views and solutions to the existing problems and serves as a voice to promote these views to others. The Foundation aims to help young People understand the beauties and limits of the world in which they live and to encourage them to act and share their experience and feelings with other communities. Since 2005 the Foundation has worked closely with the young people of Geneva to publish the Earth Focus Magazine, articles written by students from schools worldwide on humanitarian and environmental issues – sustainable development – that preoccupied and interested the authors who wished to share their feelings and promote change. Thirty-six issues were published at three thousand copies per publication and circulated worldwide. 2005 to 2014 – Role playing debates and conferences have been organised in Geneva in the Centre International des Conferences de Genève with the attendance of students from local schools, both public and private. In 2005 at the SDev05 Conference in Palexpo, Geneva, a role-playing debate was held with the participants from five schools, there were over five hundred people in the audience who were impressed with the students’ knowledge and commitment around the subject of an island in difficulty. In 2009 and 2010, in conjunction with the International School of Geneva, the Global Issues Network (GIN) Conference was organised with the attendance of 350 to 400 students from International Baccalaureate schools, members of the GIN. A conference on Human Rights Day was held every year in partnership with IBOR – International Bill of Rights and Forum for Human Rights, visitors came from several schools including the Aga Khan Academy of Mombasa, Kenya. School visits and activities arranged by Earth Focus have included visiting the re-cycling facilities of Geneva. Green Map making for Grand Saconnex – 2007, the area of the United Nations – 2009, Vernier, Meyrin, the Arboretum of Allaman, 2010 and 2011, Verbier 2013 with school visits to the Service Industrielles de Bagnes, Valais, micro-hydro installations etc. The Green Map making has included several hundred students among other participants. 2015 – 16 students have mapped Plan-les- Ouates, surrounding areas, the route of the trams 14 and the tour of Mont Blanc in conjunction with Pro Mont Blanc’s young ambassadors. They have chosen to promote the region and to learn more about mountains and Nature. In 2009 a project for an exhibition building on sustainable development, Centre Objective Terre, was presented to the Conseil d’Etat de la Republique et canton de Genève (the State of Geneva government). In January 2010 a confirmation that land would be made available for this building by the State of Geneva, partnerships have been formed and the planning is in progress for a centre of 25’000 square metres, a cultural centre for sustainable development and universal rights. As printing and mailing have become so expensive Earth Focus Foundation is developing a web platform – Sustainability.World that will be for knowledge, sharing and action for sustainable development for all ages and to be used worldwide. 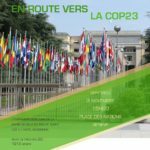 Over the years, the projects and actions of the Earth Focus Foundation have benefitted many youths and adults in Geneva and worldwide, and relationships have been formed with other non- governmental organisations working for the same goals. Contacts and partnerships have been formed in Geneva with local and global organisations and continue to be built and developed.